We will supply and install your Qik-Link platform wherever you require it throughout the UK. We can install any power or communication cables you require, and finish it with your choice of floor covering and trim. We can remove the platform once your need for it is finished. Installation and removal is undertaken by our team of professional and friendly Qik-Link installers. We’re happy and used to liaising with any in-house or third-party contractors that may also be providing services. A full risk assessment and installation statement will be completed prior to each installation. We have a network of installers covering the whole of the UK. We guarantee to install your platform quickly and professionally. We guarantee a transparent pricing model. We never charge a premium for you being the only platform we're installing at an event. 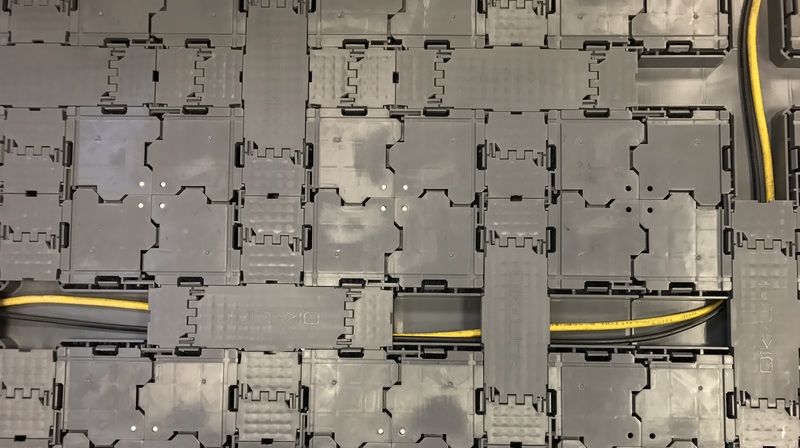 We provide a turn-key service, including platform hire & installation, working with site electricans to lay cables, floor covering supply and installation, edge trim and full de-rig. We have installed in all major event and exhibition venues across the UK. Our prices start at £20 per m2 for platform hire, install, derig including supply, installation and removal of floor covering. We can deliver Qik-Link to any company address, event location, exhibition, conference or facility in the UK. Qik-Link is available to use on a short-term hire basis. Either to be installed by yourselves or we can install ourselves. If you choose to install yourself, we would be happy to provide onsite training during your first install. Qik-Link is available to use on a long-term lease basis. We are even able to provide free storage on all long-term lease contracts. Qik-Link raised modular flooring is available to purchase outright. Supplied in 1m x 1m sections, unless required otherwise, each tile is guaranteed for 2 years under normal guideline usage. We supply a huge range of different floor coverings. Whether you require a carpet, vinyl, wood laminate, artificial grass, natural covering or printed floor we’ve literally got it covered! 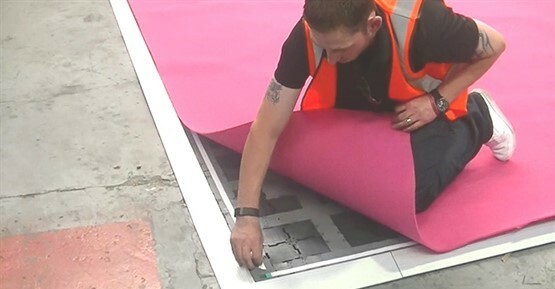 We can install along with Qik-Link modular flooring if required, or supply in a self-installation basis. We can take care of all installations of cables whether communication or electrical using one of our Qik-Link in-house electricians. Or we can simply lay the cables ready to be connected by your own contractors. We supply a range of platform trims and ramps. These can be purchased or hired and supplied on either a purchase or hire basis.